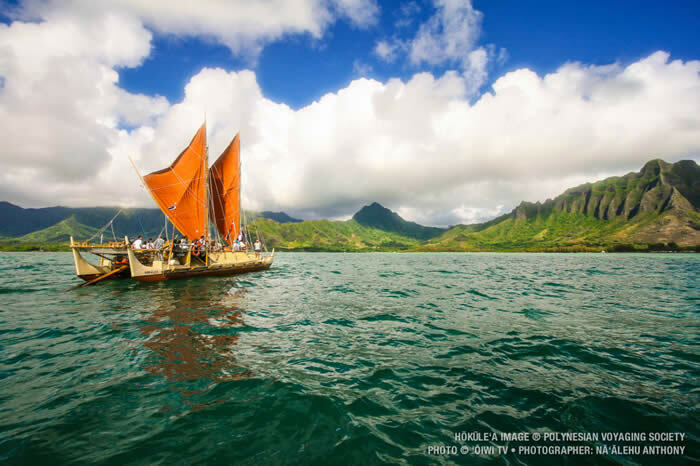 WHY IS HOKULE’A SAILING AROUND THE WORLD? "In view of the last thirty years of good science, our sail plan, in relationship to the Earth, needs to change. Malama Honua is a voyage about responsibility. It’s about letting go the lines. It’s about rediscovery, exploration, finding new ways to look at the world and discover a new worldview that is going to be helpful so that our children will inherit a healthy planet. We alone will not change the world. We believe that there is a whole global movement out there that is pushing back against the negative future that many see and we just want to be part of that movement rather than being tied to the dock. This voyage is dangerous. It costs a lot of money. It takes a lot of human resources. But that’s what a voyage is. The engagement with French Polynesia, American Samoa, New Zealand, the United Nations – everywhere we go – it seems that everybody feels some responsibility to the Earth and to our children. The reception of the canoe is not just about Hokule’a, it is the idea that we need to explore, to unify, that common vision and shared values are important for the Earth. We are just following many, many people around the planet who are already on the journey. There always comes a moment when you hesitate. When you step back and say, “wow, this is an extraordinarily difficult thing to do. This is just one of thousands of voyages – whether it is at the University of Hawaii, a public school, those who protect the oceans – on and on – there are thousands and thousands of voyagers. But it is important to remember that Hokule’a is a Hawaiian canoe. This canoe and most of its crew comes from Hawaii. We need to feel that we have earned the right to go. If Hawaii is not with us then we are representing nothing. But in the end we are looking at a larger culture. One that is human. One that is global. That is not based on race, the boundaries of geography, but one that is based on values - kindness, caring, compassion - because on this voyage we are seeking a destination that is called peace. My father said, “it is time that we believe that our Hawaiian culture is strong enough in its sense of aloha and its vision that it is time to go.” Those two men – a social worker and an astronaut - planted the seed. They wrote the instructions for us. So every day that I am at sea I remember these two men. When I see in my mind my best friend and my father I know why I am on this voyage. But this is not my voyage. I am just doing what I was told to do." On Thursday, June 18, I went down to the Patagonia store in New York’s SOHO district to meet Jill Black and Justin Gurney from the New York Outrigger Canoe Club. They had invited me to moderate a presentation about Hokule’a’s Malama Honua Worldwide voyage at seven PM that night. We screened three of the ‘Oiwi TV videos about the voyage to a packed room and then connected via Google Hangout to Bryson Hoe, Na’alehu Anthony and Miki Tomita in Honolulu who answered questions and discussed the voyage in more detail. Following that, I read some passages from my book – Hawaiki Rising – and “talked story” with the crowd for about 30 minutes. Everyone seemed very enthusiastic about Hokule’a’s visit to Manhattan in June of next year and the crowd milled around for a long time asking questions and discussing the voyage.